^ a b c Lassell, W. (1848-01-14). “Observations of satellites of Saturn”. 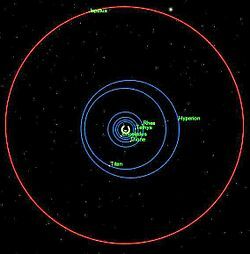 Monthly Notices of the Royal Astronomical Society 8 (3): 42–43. Bibcode: 1848MNRAS...8...42L. doi:10.1093/mnras/8.3.42. http://adsabs.harvard.edu//full/seri/MNRAS/0008//0000042.000.html 2011年12月18日閲覧。. ^ a b c d Roatsch, Th. ; Jaumann, R.; Stephan, K.; Thomas, P. C. (2009). Cartographic Mapping of the Icy Satellites Using ISS and VIMS Data. pp. 763–781. doi:10.1007/978-1-4020-9217-6_24. ^ Castillo-Rogez, J. C.; Matson, D. L.; Sotin, C.; Johnson, T. V.; Lunine, J. I.; Thomas, P. C. (2007). 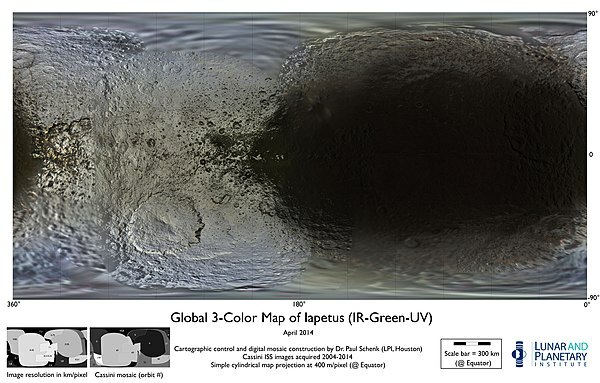 “Iapetus' geophysics: Rotation rate, shape, and equatorial ridge”. Icarus 190 (1): 179–202. Bibcode: 2007Icar..190..179C. doi:10.1016/j.icarus.2007.02.018. https://www.sciencedirect.com/science/article/pii/S0019103507001108. ^ a b c d e f Spencer, J. R.; Denk, T. (2010-01-22). 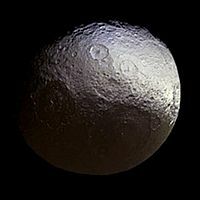 “Formation of Iapetus' Extreme Albedo Dichotomy by Exogenically Triggered Thermal Ice Migration”. Science (AAAS) 327 (5964): 432–435. Bibcode: 2010Sci...327..432S. doi:10.1126/science.1177132. PMID 20007862. http://www.sciencemag.org/cgi/content/abstract/science.1177132 2010年1月22日閲覧。. ^ a b c d e Denk, T. et al. (2010-01-22). 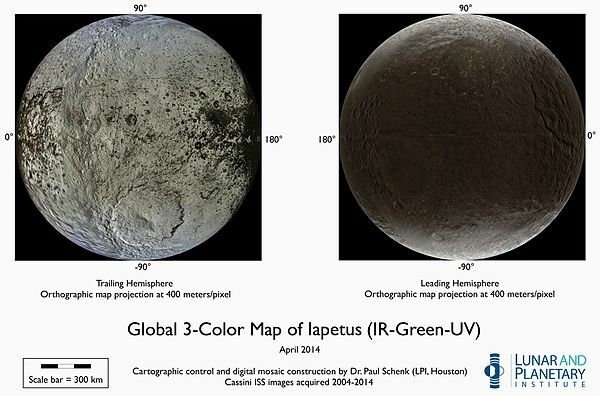 “Iapetus: Unique Surface Properties and a Global Color Dichotomy from Cassini Imaging”. Science (American Association for the Advancement of Science) 327 (5964): 435–439. Bibcode: 2010Sci...327..435D. doi:10.1126/science.1177088. PMID 20007863. http://www.sciencemag.org/cgi/content/abstract/science.1177088 2010年1月22日閲覧。. ^ Hendrix, A. R.; Hansen, C. J. (2005-03-14). 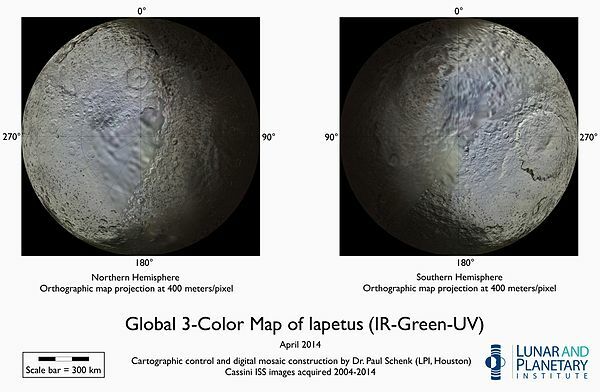 “Iapetus and Phoebe as Measured by the Cassini UVIS” (PDF). 36th Annual Lunar and Planetary Science Conference. http://www.lpi.usra.edu/meetings/lpsc2005/pdf/2272.pdf. ^ Kerr, Richard A. (2006-01-06). 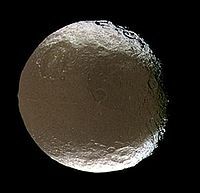 “How Saturn's Icy Moons Get a (Geologic) Life”. Science 311 (5757): 29. doi:10.1126/science.311.5757.29. PMID 16400121. http://www.sciencemag.org/cgi/content/summary/311/5757/29. ^ Ip, W.-H (2006). 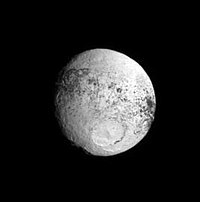 “On a ring origin of the equatorial ridge of Iapetus”. Geophysical Research Letters 33 (16): L16203. Bibcode: 2006GeoRL..3316203I. doi:10.1029/2005GL025386.